It is at this point that I give usually give the candidate a list of possible remedies that may be taken to meet our guidelines upon re-application. Since it is clear that the barriers to your candidacy will not be eliminated after undertaking a physical fitness regimen or Pashto language immersion program, I will use this space to gently mock you and your application. I consider this opportunity a job perk, just like the monthly bus pass and the license to kill. Your application was not an application per se, but a list of “capabilities” spanning 15 single-spaced pages. I use quotes, because most of your “capabilities” are simply fragments of plot lines for what I can only imagine is your unwritten spy novel. Never in my 30-year career have Agency resources been needed to fight mad scientists or power-hungry barons with facial scars or glass eyes. We spend most of our time doing things like infiltrating the Rent is Too Damn High Party and fixing Afghan Goat Polo matches. Even if we did have motorcycle chases through the open-air markets of Nairobi and gun battles with henchmen on top of bullet trains, we wouldn’t send in a giant, round, fuzzy stuffed narwhal to do the job. You will never be a convincing undercover agent unless your cover involves posing as a … giant, round, fuzzy stuffed narwhal. One simply does not find giant, round, fuzzy stuffed narwhals in the tribal regions of Pakistan or the back rooms of Belgrade eating ćevapčići with arms dealers. Nevertheless, your application gave me a little bit of hope. You seem like an earnest, patriotic young marine mammal and you clearly believe in the agency’s mission, even though you misunderstand our methods. I believe I speak for a lot of people here at the CIA when I say that it will be a great day when Vladimir Putin buys a giant, round, fuzzy stuffed narwhal to use as an accent pillow in his bedroom. People’s Liberation Fronts and Maoist insurgencies the world over would be far better places if they had the kind of “fun” offices where someone can perch a giant, round, fuzzy stuffed animal on top of their cubicle. When that day comes, you will be the first one we will call upon to go in with a wire. Keep reaching for your dreams, Nina Jr. Maybe you can tie all of those “capabilities” together into a novel! 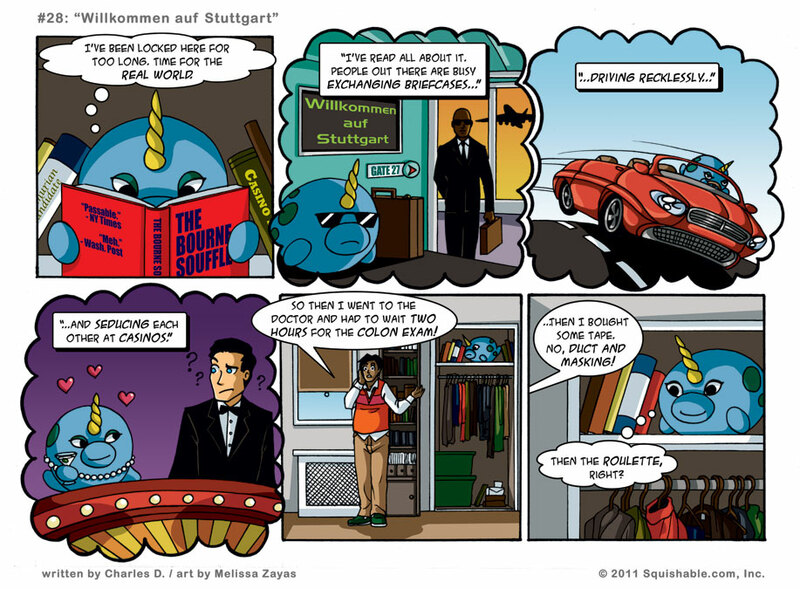 I now want to write some Squishable James Bond stories, where a narwhal is the dashing lead. loooove the “seducing in casinos” need 100×100 icon!! …And suddenly Nina Jr becomes the most interesting character in the strip! Nina Jr. would make an excellent spy, just send her as a gift (from an anonymous admirer) and the infiltration has begun. Shame the CIA couldn’t see these advantages.